It's been a while since you last heard from us but no need to worry, we've been working harder than ever on improving Temponia. 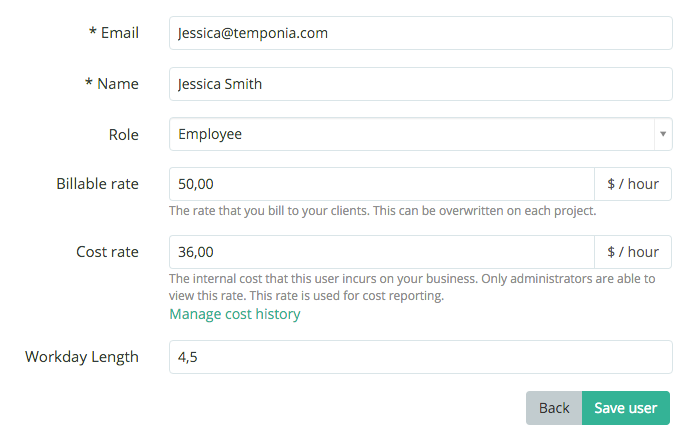 Our latest addition to Temponia is the ability to track costs. 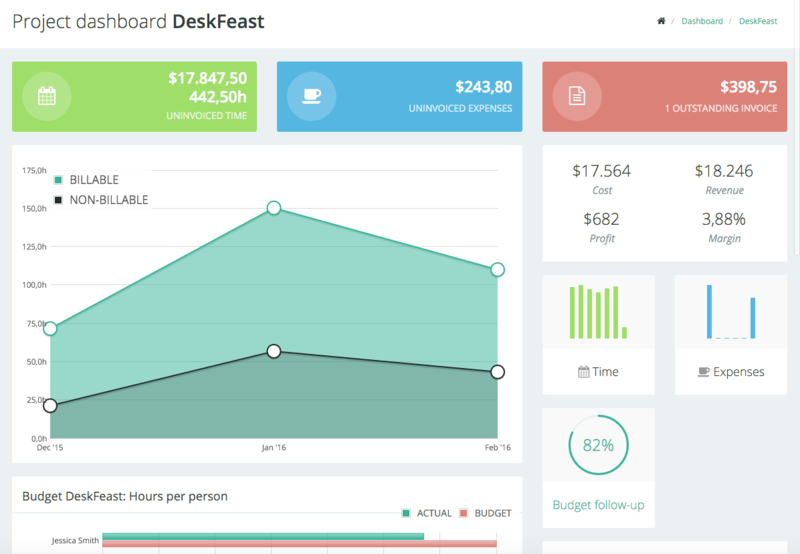 Administrators are now able to set a cost / hour per employee and get detailed reports on this. To do so you can go to the profile of the user (Manage => Users => Edit) and set the cost rate / hour. This is the internal cost the user incurs on your business. This cost rate can be set historically because of course over time, the cost can change. Once the cost has been set, you will be able to view total cost, revenue, profit and profit margin on the project dashboard pages. Only administrators are able to set and see costs! We have also completely renewed our budget report. 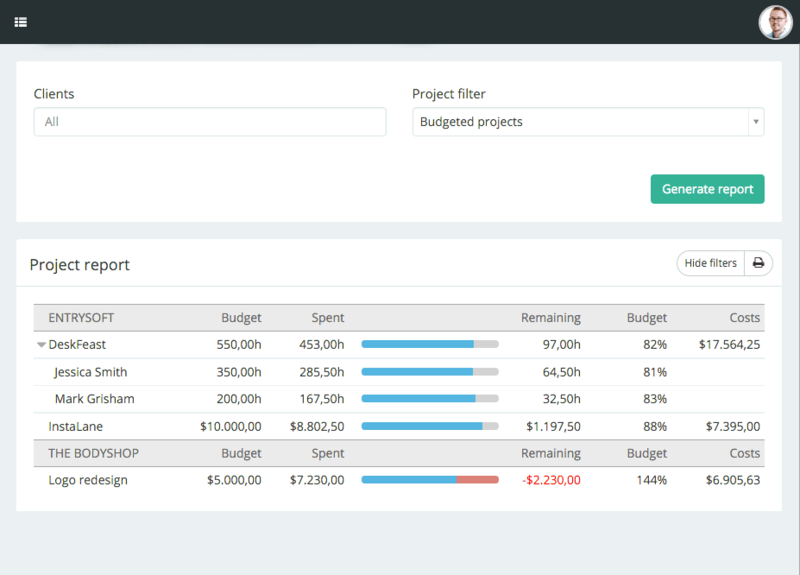 This report is now called Project report and gives you a nice overview of all your project, their current budget status and (if configured) costs. We hope you like these new improvements, and as always: we're more than happy to hear your feedback! Please use your own web address to log into your account. This was sent to you upon registration. In case you cannot retrieve your subdomain please enter your e-mail address below and we will send your registration info. The following terms and conditions govern all use of the temponia.com website and all content, services and products available at or through the website. The Website is owned and operated by Entrysoft. If you create an account on the Website, you are responsible for maintaining the security of your account, and you are fully responsible for all activities that occur under the account and any other actions taken in connection with the site. You must immediately notify Temponia of any unauthorised uses of your subdomain, your account or any other breaches of security. Temponia will not be liable for any acts or omissions by You, including any damages of any kind incurred as a result of such acts or omissions. ◦ Paid services are available on the Website. By selecting this you agree to pay Temponia the monthly or annual subscription fees indicated for that service. Payments will be charged on a pre-pay basis on the day you sign up for those services and will cover the use of that service for a monthly or annual subscription period as indicated. Fees are not refundable. There is a no strings-attached trial period during which you can try out the system and the process. After this trial you can decide if they want to continue using Temponia by paying the monthly or annual subscription fees. You can also choose to opt for the free plan which has limited projects / users. There is no automatic renewal, you will be notified when your contract comes to an end and at such time choose to extend it. Temponia reserves the right to display advertisements. Temponia reserves the right, at its sole discretion, to modify or replace any part of this Agreement. It is your responsibility to check this Agreement periodically for changes. Your continued use of or access to the Website following the posting of any changes to this Agreement constitutes acceptance of those changes. Temponia may also, in the future, offer new services and/or features through the Website. Such new features and/or services shall be subject to the terms and conditions of this Agreement. If you wish to terminate this Agreement or your Temponia account (if you have one), you may simply discontinue using the Website. All provisions of this Agreement which by their nature should survive termination shall survive termination, including, without limitation, ownership provisions, warranty disclaimers, indemnity and limitations of liability. The Website is provided “as is”. Temponia and its suppliers and licensors hereby disclaim all warranties of any kind, express or implied, including, without limitation, the warranties of merchantability, fitness for a particular purpose and non-infringement. Neither Temponia nor its suppliers and licensors, makes any warranty that the Website will be error free or that access thereto will be continuous or uninterrupted. You understand that you obtain services through, the Website at your own discretion and risk. In no event will Temponia, or its suppliers or licensors, be liable with respect to any subject matter of this agreement under any contract, negligence, strict liability or other legal or equitable theory for: (i) any special, incidental or consequential damages; (ii) the cost of procurement for substitute products or services; (iii) for interruption of use or loss or corruption of data; or (iv) for any amounts that exceed the fees paid by you to Temponia under this agreement during the twelve (12) month period prior to the cause of action. Temponia shall have no liability for any failure or delay due to matters beyond their reasonable control. The foregoing shall not apply to the extent prohibited by applicable law. You represent and warrant that (i) your use of the Website will be in strict accordance with this Agreement and with all applicable laws and regulations (including without limitation any local laws or regulations in your country, state, city, or other governmental area, regarding online conduct and acceptable content, and including all applicable laws regarding the transmission of technical data exported from Belgium or the country in which you reside) and (ii) your use of the Website will not infringe or misappropriate the intellectual property rights of any third party. Indemnification. You agree to indemnify and hold harmless Temponia, its contractors, and its licensors, and their respective directors, officers, employees and agents from and against any and all claims and expenses, including attorneys’ fees, arising out of your use of the Website, including but not limited to your violation of this Agreement. Not completely clear how Temponia can solve your business needs?